Although you might not recognize the name, you most likely will recognize the look. Mondrian Art is an abstract form of art that uses a creative layout of squares and rectangles, often filled in with primary colors. This style of painting was popularized by Dutch artist Piet Mondrian during the early 1900's. In addition to influencing art, the Mondrian look has shown up in fashion, architecture, advertising, design, and more. 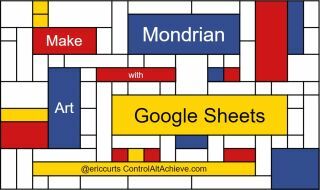 Because Mondrian Art is composed of lots of different sized rectangles and squares, it is the perfect style to be created with digital tools... specifically with Google Sheets! As we have explored in many previous posts, Google Sheets can do much more than just crunch numbers. Sheets is a fantastic tool for writing prompts, online games, interactive learning databases, and more. Mondrian Art is just one more project to add to the list. Normally spreadsheets have rectangular cells. However, to make Mondrian Art you will want to start with a base of all square cells, which you can then merge as needed to form the rectangles you want. In this template I have changed the columns widths and row heights to make all of the cells square. Use your mouse to select the rows or columns you want to adjust. To do so, click and drag over the columns or row headers. With the columns or rows selected, right-click on the headers and choose "Resize columns" or "Resize rows". Type in a new width or height value. Repeat as needed to get the sizes you want. Select all of the cells in the Sheet by clicking in the blank spot in the top left corner between Column A and Row 1. When you click this spot, all of the cells in the Sheet with be selected. Next, click the "Borders" button in the toolbar. From the "Border style" option, click the third choice down for the thick black line. Now click the "All borders" options to apply this style to all of the cells. Mondrian usually filled the rectangles in his paintings with primary colors. Later when you color your rectangles, you can just use the standard colors provided in the "Fill color" (paint can) button. However, I did include a few custom colors in the template based off of actual Mondrian paintings if you wish to use those. As mentioned above, Mondrian Art is composed of many rectangles of different sizes. In our template, all of the cells are square, so what we need to do is merge cells together to create our rectangles. Click in a cell that will be one of the corners in your rectangle. Now click and hold down your mouse button, and with the mouse button held down, drag to select the others cells that will make up your rectangle. Alternately if you prefer to use your keyboard, you can click in one cells, then hold down the "Shift" key on your keyboard, and then with that held down, use your arrows keys to select more cells. The cells will now be merged! Note: If needed, you can always unmerge cells as well. Simply click on the merged cells, then click the "Merge cells" button in the toolbar, or click "Format" and then "Merge cells" and then "Unmerge".Keep repeating this process to merge cells into rectangles to create your design. Click inside a rectangle to select it. Then click the "Fill color" button in the top toolbar (it looks like a paint can). You can now pick from any color you would like to use to fill in the rectangle. Mondrian typically used primary colors, and our template includes a few custom colors that closely match the ones he used. Again, there is no "right" colors to use, so be as creative as you wish. Chances are you will probably not use all of the squares in the template to make your Mondrian Art. If you end up having extra rows and columns that you do not need, you can delete these extras so just your artwork if left. To delete rows or columns, do the following. Use your mouse to select the rows or columns you want to delete. To do so, click and drag over the columns or row headers. With the columns or rows selected, right-click on the headers and choose "Delete columns" or "Delete rows". Alternately you can click "Edit" in the top menu bar and then select "Delete columns" or "Delete rows". Enter the people you want to share the Sheet with and the permissions you want to give them. Or click the "Get shareable link" option to get a link you can give to anyone through email, social media, on your website, or such. Adjust the print settings as needed, including the "Scale" option to get it to look just the way you want. You can also make a PDF version of your Mondrian Art. Click "File" then "Download as" then "PDF". Adjust the export setting as needed, including the "Scale" option to get it to look just the way you want. Click "Export" to save the PDF. Google Sheets does not have an option to export the Sheet as an image. However you can use one of many screen capturing tools to take a screenshot of your creation and then save that as an image. One good example would be the Chrome extension Nimbus Screenshot. First, follow the steps like you are going to print the Sheet, by clicking "File" then Print". Now that you have a nice clean view of your creation, use the screen capture tool of your choice to take and save a screenshot. Area - Find the area in square units for each of the colors used. Fractions - Find the fraction that each color represents, and simplify to lowest form. Once again Google Sheets proves itself to be a versatile tool for student creativity! Hopefully your students will find this to be an engaging activity to learn about Piet Mondrian and his influence on design, as well as learn some new spreadsheet skills, and express themselves through art. As always, please feel free to share examples of what your students make in the comments below.